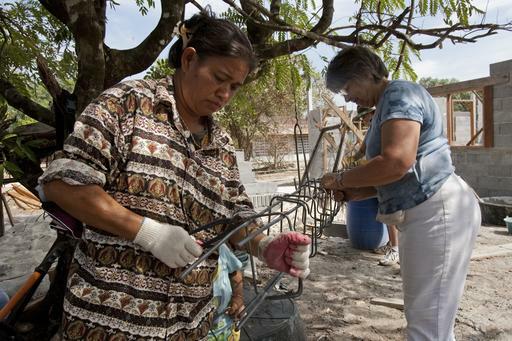 Volunteers work with housing recipients to rebuild homes on the island of Koh Kho Khao, Thailand, after the 2004 tsunami. Photo courtesy of Alyce Henson/RI. DNA RAG will develop an interactive network to assist with disaster preparedness, communication, and recovery at an international level. The group’s primary focus will be on disaster preparedness with an emphasis on communication between the affected area and potential assistance for long term recovery. DNA RAG’s founders offer expertise and hands-on experience through their involvement with several Rotarian and non-Rotarian disaster relief initiatives such as Rotarian Emergency/ Disaster Initiative (REDI), Haiti Disaster Task Force, Caribbean Partnership, Rapid Disaster Response Task Force, Disaster Aid Australia, and ShelterBox. The founding members have coordinated Rotarian efforts in support of disasters such as Hurricane Katrina (New Orleans, USA), Hurricane Sandy (Caribbean islands and northeastern USA), the Haiti earthquake, and others. If you’re participating in the 2015 RI Convention in Sao Paulo, attend the RAG’s breakout session on disaster relief 8 June..
For more information or to join, contact Chair Barry Rassin. 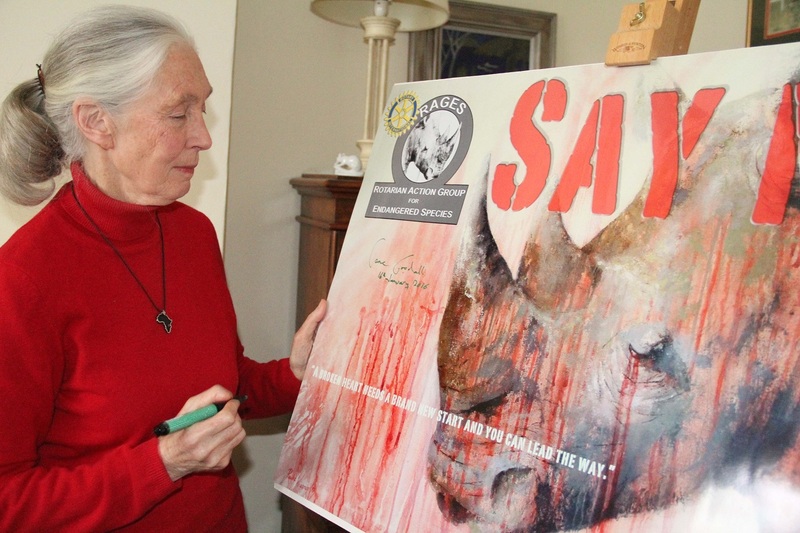 Dr.Jane Goodall joins RAGES’ “SAY NO!” campaign to promote animal conservation. Photo courtesy of RAGES. RAGES will mobilize the Rotary family and provide global awareness and focused action to preserve and protect endangered species and the communities that depend on them. While the group will initially focus on elephants, rhinos, mountain gorillas, and chimpanzees in Africa, RAGES aims to expand its focus as new species and areas of emphasis are identified. RAGES emerged from Save Our Rhino Project, a Rotary club-led project in South Africa. The group is currently working on an education program to conserve elephants in the Oloimugi Maasai Village in Kenya in partnership with the Rotary Club of Coolamon in Australia and the Jane Goodall Institute via her global Roots & Shoots program. Don’t forget to tell your Rotaract and Interact clubs about RAGES as the group plans to heavily involve Interactors and Rotaractors in their programming. Visit the group’s website for more information. Jenni Huntly, a volunteer midwife with Midwives for Haiti, examines Maritha Pierre, who is eight months pregnant. Photo courtesy of Alyce Henson/RI. The RAG advocates for clubs and districts to participate in helping achieve the 4th and 5th UN Millennium Development Goals to reduce child mortality by two thirds and to reduce the maternal mortality ratio by three quarters. The group will promote preventative care to men and women and prepare them for healthy parenthood by making sure they are properly nourished, lead a healthy lifestyle, and have access to public healthcare. The RAG’s founding members are bringing a wide range of expertise to address various health risks for future parents and newborns such as medicine, public health, pediatrics, biology, and human genetics. Rotarian Action Groups are organized by the Rotary family for the Rotary family, tackle issues such as malaria, population and development, and more. Join one and share your expertise and passion with others. Rotarians, their family members, and Rotary program participants and alumni are invited to join these groups. See a complete list of existing RAGs. Interested in starting a new group? Find out more information.